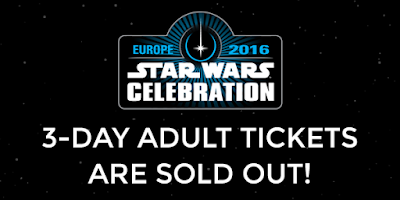 3-Day Adult Tickets Are Sold Out For Celebration Europe 2016! A mere three months has lapsed since the phenomenal Star Wars: Celebration Anaheim took place. On the final day of the Anaheim Convention, it was announced that London would host Star Wars: Europe Celebration in 2016. The reported attendance at Celebration:Anaheim was approximately 70,000 fans. The large presence of fans has certainly set the tone for future Star Wars Celebrations, based on today's breaking news. Today, the Twitter Handle - @SW_Celebration - revealed that 3 day tickets for Celebration London have sold out. "@SW_Celebration: Star Wars Celebration 3-Day Adult Tickets are SOLD OUT! Buy Single Day Tickets #SWCE"
So best advice would be to order your single day tickets in the next few weeks, as it seems London will be a massive hit!